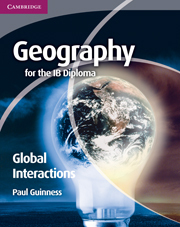 Two new coursebooks for the Geography for the IB Diploma syllabus. 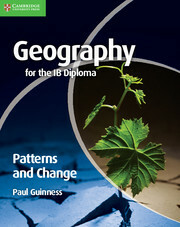 This lively coursebook covers the four compulsory topics of the Core theme, Patterns and Change, in the Geography syllabus for the International Baccalaureate (IB) Diploma Programme. It is written in clear, accessible English by a highly experienced author and former head of Geography at a major IB school in the UK. The coursebook contains: key questions outlining the issues for each topic; case studies selected from every continent; activities and geographical skills guidance; discussion points and research ideas; integrated Theory of Knowledge links; examination-style questions; definitions of key terms and useful web links. Key questions to stimulate thought on the main issues for each sub-topic. Theory of Knowledge links integrated into the topics. Case studies from around the world, providing examples for reference. Activities and geographical skills exercises to practise techniques. Discussion points and research ideas to explore the topics further. Examination-style questions on each sub-topic in the syllabus. Definitions of key terms for easy reference in each chapter. Useful web links for further reading and research.